All of the golf cart parts and accessories won't mean anything if you are not comfortable riding in your golf cart. 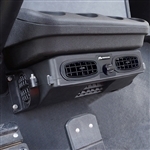 These golf cart fans, golf cart air conditioning, and golf cart heater products will keep you comfortable in hot or cold weather. Let Jason's Golf Carts & Accessories take care of all of your golf cart needs! This category at Jason's Golf Carts is where you will find items to keep you comfortable in the heat of summer or in the cold of winter. Golf carts fans are great for keeping you cool and can be permanently installed in your cart. Some golf cart fans mount to the dash while others mount to the roof of the golf cart. If you are trying to stay warm in your golf cart, don't miss out on our gas and electric golf cart heaters or our golf cart heated seats.